I am a student that's very new to magnetism in general and I've been reading/learning for the past few weeks. I'd like to build magnetic tweezers to use in materials with kPa order stiffness - so I would need very high fields and gradients. However, from the little I understand, it looks like if I use ferromagnetic particles with the magnetic tweezers, the forces applied only depend on the field gradient? Torque doesn't matter to me - I just need to observe the displacement of the particles. How do I generate very high/steep magnetic field gradients? Do I automatically need very high fields in order to have steep gradients? I've done a lot of searching and all I could really find was a Helmholtz/Maxwell coil pair. I was wondering if there were any other ways to generate a very steep magnetic field gradient? I am also open to using permanent magnets. For more detail, see an example at the end of ch. 11 of my book Simple Nature. How can a paramagnetic element be a permanent magnet? Why do ferromagnetic materials channel magnetic field lines? Electron beam in magnetic field - increase or decrease the field? 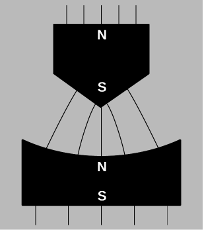 Would setting a magnetic base to the “off” position remove the torque from an external field? What does the magnetic field around a refrigerator door look like? How have “natural” permanent magnets been magnetised? Can a magnetic field exist without an electric field present?